The community of Overbrook, called Fairhaven in its early existence, descended from Baldwin Township , which was the parent of nine other municipalities. The township was created at the request of area residents who then lived in the adjoining townships of Upper and Lower St. Clair, Jefferson, and Mifflin. Baldwin Township received its charter from the Allegheny court of Quarter Sessions and was surveyed by Stephen Woods, James Scott and William Kerr in 1843. Soon after the proposed territory of 10,446 acres was surveyed, the county court granted a subdivision. The new district took its name from Justice Henry Baldwin who had signed the legislation enacting its existence on February 24, 1844. Prior to the arrival of white settlers, our area’s first residents were scattered groups of Delaware Indians who occupied the land and hunted in the woods of Baldwin . Arrow heads and tomahawk blades, along with other artifacts have been found within our boundaries. Although white settlement began in and around Fairhaven as early as 1756, records of these endeavors are vague. The earliest of settlers to be documented in 1789 were John Varner, Jacob Crady, John Stewart, and William Wightman. There was a strong German element among the early population and this nationality predominates to the present. William Wightman purchased his property from local Indians in exchange for one metal ax and constructed a log residence in the vicinity of present day Maytide Street. His land bordered portions of what are now Saw Mill Run, Brownsville road, and Overbrook Blvd. Beck’s Run, Street’s Run, and the Saw Mill Run were listed as the most important streams in Baldwin ’s history. Saw Mill Run and a tract of land along it were patented by the Commonwealth of Virginia around 1770. Scholars speculate that George Washington, who held titles on Chartiers Creek, was familiar with the Saw Mill Run area. While the land was valuable for farming and gardening, the underlying strata of coal constituted the greatest source of wealth. Early in the 1800’s there were two gristmills in Baldwin Township both on the Saw Mill Run, one at Castle Shannon and the other at Fairhaven . 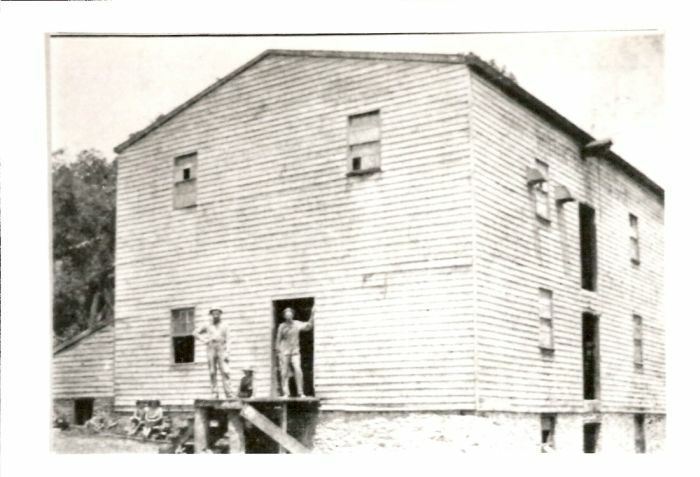 The gristmill in our community was established in our community was established by the Brisbon family who transported millstones from Philadelphia . By all accounts, the mill was established at “South Bank” around present day Nobles Lane and Whited Street . A second gristmill was founded in Fairhaven in 1850. A saw mill was located near the primary gristmill but was abandoned in 1881. The gristmill, owned by James Foster, burned to the ground in 1907. The fire originated in the mill and was discovered about 8 o’clock in the evening by Walter Englert, shouting “fire” and shooting a pistol in the air three times. This fire demolished the entire block, including a grocery store owned by Charles Young, the post office, the Fair Haven School and the railroad station. A hotel replaced the old mill in 1914. The gristmill was located by what in now the entrance to the busway at Glenbury Street . This page was last modified on 18 July 2008, at 14:12.